How long does a watch need to be out of production for a new iteration to be considered a reissue? Is nine years long enough? That’s how long it’s been since Seiko last offered the Samurai, and I really don’t know whether to call these new watches “reissues,” “updated versions,” “second-generation” or what. True to form, Seiko offers no conclusive evidence of their intentions, so all we can really say for sure is that the Samurai is back. Contributing to this confusion is the original Samurai’s light-speed rise to cult status. Issued in 2005 and discontinued in 2009, a mere four-year run, the first-generation Samurai captivated enough Seiko enthusiasts to have garnered its nickname, an honor bestowed on only a few models. There’s nothing like discontinuing a watch to send a collector community into a joyful panic, and Seiko collectors—a vast and aggressive breed—moved in like sharks on a carcass. Today, an original Samurai full-set is somewhat rare and can fetch over three times its original retail price, not exactly a record-setting figure, but certainly a unique phenomenon for a low-priced, mass-produced watch only recently out of production. Seiko obviously noted the rising demand for the original Samurai and now offers a new version in a few colorways: a limited edition two-tone “Blue Lagoon” SRPB09 (which sold 6000 units pronto), the blue and silver SRPB49, the black and gray SRPB51, the Pepsi SRPB53, and the golden hued SRPB55. This fall Seiko offered an additional Amazon-only release in orange, the SRPB97 (which is in hand here for review), and they’ve since offered a non-exclusive SRPC07 that appears to be identical, but ships with a bracelet only. (Confusingly, early images of the SRPC07 showed a waffle pattern on the orange dial, but shipped watches are smooth like the exclusive SRPB97). The orange SRPB97 sure feels like a reissue. It is overtly based on the discontinued Samurai SBDA005. Folks seem to hold onto those orange titanium models, thus shrinking the supply and lifting the prices. Seiko hasn’t claimed that the SRPB97 is a limited-edition any more than they called it a reissue, but the way they released it—with pre-sale discounts and only one point of sale—felt more like a small-batch micro-brand offering than one from a watchmaking titan. I imagine the Samurai collector community is basking in the recognition from Seiko, perhaps experiencing warm-fuzzies like Speedmaster fans did when Omega released the Speedy Tuesday model. 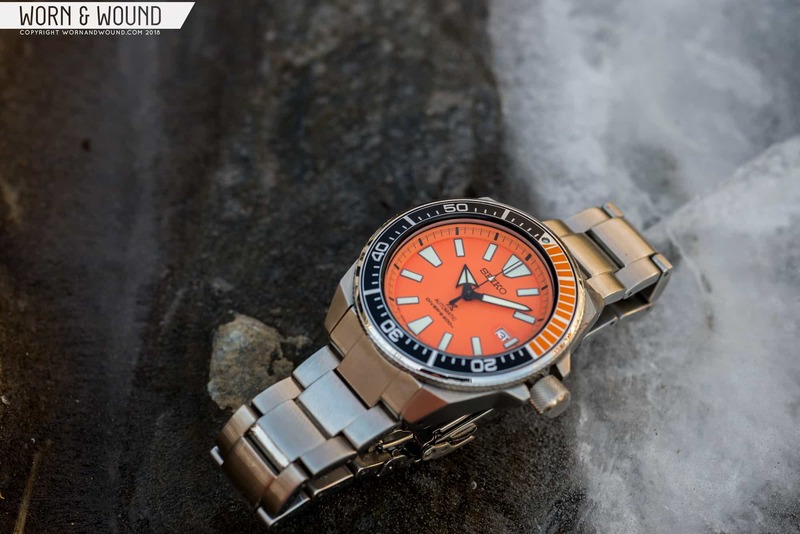 At a glance, distinguishing the original orange titanium Samurai from the brand new SRPB97 isn’t obvious, but notable differences are there. The new Samurai’s case is steel, measures 43.8mm wide, up from 42mm, and it eliminates four prominent circular “pins” previously found on the outer side of each lug. The new dial includes larger, more angular hour-markers and a stocky arrow for an hour-hand (the same one found on a number of vintage and current Seiko divers). Text is changed-up a bit, and—to my disappointment—the date window is no longer outlined in black, a touch that helped integrate the date with the hour-markers on the original orange-dialed Samurai. Seiko has swapped out the first-generation 7S26 movement for their 4R35 on the 2017 models. The original movement didn’t hack or hand-wind, but the 4R35 in the SRPB97 does both. I find the crown easy to get into the middle position for setting the date, and the date wheel clicks with satisfyingly pronounced tactility. The ratio is such that you can whip that date-wheel around at about 5 days per crown-turn, but slow down as you approach your target date as it’ll get cocked between numbers if you turn it even slightly too far. For fans of high accuracy, the 4R35 movement can be tweaked to keep time within just a few seconds a day. The bezel clicks have a hollow, ringing sound (likely a spring resonating), which always makes me think the mechanism is of lower quality. That notion, however, is thoroughly irrational, and the bezel on the SRPB97 feels great, achieves perfect alignment at 1/2-second intervals (not always the case with Seiko divers of late), and offers ideal resistance for gloved operation (even in neoprene for those braving cold waters). The bezel insert is aluminum, angled up toward the watch’s center, and provides around a 1mm recess for the flat Hardlex crystal. Above water, crystal reflections are impressively minimal; submerged, where light behaves quite differently, the Hardlex offers perfectly clear viewing at most angles. The lume charges up in a snap, glows brilliantly, and stays that way all night long. Add in the orange dial, and there’s just no ignoring this watch. For those worried that the 43.8mm case will be too large, don’t fret. The angular lugs are squat and turned down toward the wrist, with a lug-span of just 45mm. It’s practically square. Compare it to a decidedly smaller watch like the Sinn 556 at 38.5mm x 43mm, and you see that the 45mm lug-span of the Seiko Samurai is quite short. A friend who typically wears watches around 36mm was shocked to find that the Samurai looked and fit beautifully on his 6.25” wrist. At 12.8mm thick, you’ll have to roll up your Brunello Cucinelli two-button tunnel cuffs, but the watch isn’t ridiculously thick. Overall it’s pleasingly chunky, yes, but huge it is not. The SRPB97’s case is a multi-faceted, trapezoidal marvel that evokes origami as well as the mullet helmets and draped armor plates worn by Samurai warriors—thus the nickname (though origin stories vary). Transformer toys and late-model Subarus come to mind, both of which exaggerate their angular exoskeletons in order to signal extreme ruggedness. Similarly, the SRPB97 looks as if a futuristic, brushed-steel fortress (the armor) has partially encased a traditional, polished, curvilinear watch (the living being inside). I also can’t help but think of a SCUBA diver sporting a protective neoprene suit, mask, fins, and so on. Once one embraces the metaphor, this is a delightful design that discards continuity in favor of dramatically interrupted surfaces and contrasting finishes, all of which provokes the deeper narrative of battle-readiness. Drilled lugs—an unexpected treat for strap-swappers—also suggest that something traditional and more vulnerable resides within the chunky exterior. Orange-dialed dive watches are so distinctive that they almost constitute their own genre. Largely dominated by Doxa and Seiko, over the years Bulova, Gruen, Timex and others have tried it out, but few major league brands have offered an orange dial. Most brands bring the safety-oriented color into their dive watches as markers, bands, chapter rings, bezel inserts and other accents. But Seiko and Doxa have unabashedly let their orange dials scream for decades, and, no matter how many decades go by, orange-dialed dive watches, in turn, scream “The 1970s.” An indelible mark of that era, the orange dial certainly gives the SPRB97 an anachronistic, pre-dive-computer vibe. Perhaps this ‘70s aura contributes to the sense that this watch is a reissue—though we’d have to concede that the first-generation orange Saumrai would also qualify. There are performance advantages to orange dials, including marginally better legibility at depth (though orange light is absorbed almost entirely when submerged to 50 feet). Orange is, however, easy to find in the shallows just off shore, should one plop it into the drink, though a more likely scenario would be locating the thing in the depths of a gear-laden duffle bag. But let’s be honest: most people wear dive watches as lifestyle accessories, so in a majority of instances the orange dial’s duties will end at grabbing people’s attention faster than a traffic cone. In my experience, the SRPB97 is a compelling conversation starter, even among those who aren’t interested in watches. In many ways, the SPRB97 is a watch of its moment. Retro styling is ubiquitous today, as are tool watches more generally, yet, most importantly, the notion that brands can and will respond directly and swiftly to enthusiasts’ interests reflects this era’s evolving business strategies. Without real-time, fine-grained knowledge of consumer interests, right down to the ultra-niche collector level, it’s hard to imagine that Seiko would have even known to “reissue” or “revamp” or whatever they did when they brought the Samurai back. The SRPB97, with its oddball case design, chunky-but-wearable dimensions, and screaming orange dial transports us back to the all-analog 1970s while simultaneously confirming that Big Brother is listening. The upshot is that, sometimes, he just might give us exactly what we want.